For the past 100 years, African-American and other minority leaders have been decrying the adverse impact that mass immigration - especially illegal immigration - has on their communities. UPDATE: See further below, for immigration's impact on Hispanic and Asian Americans. Immigration impacts minorities the most. The Hon. Barbara Jordan was appointed to Chair the Commission. Liberal columnist Monroe Anderson on how immigration impacts African-Americans. The other side of deportation. Report from the Institute led by the distinguished Dr. Claud Anderson. 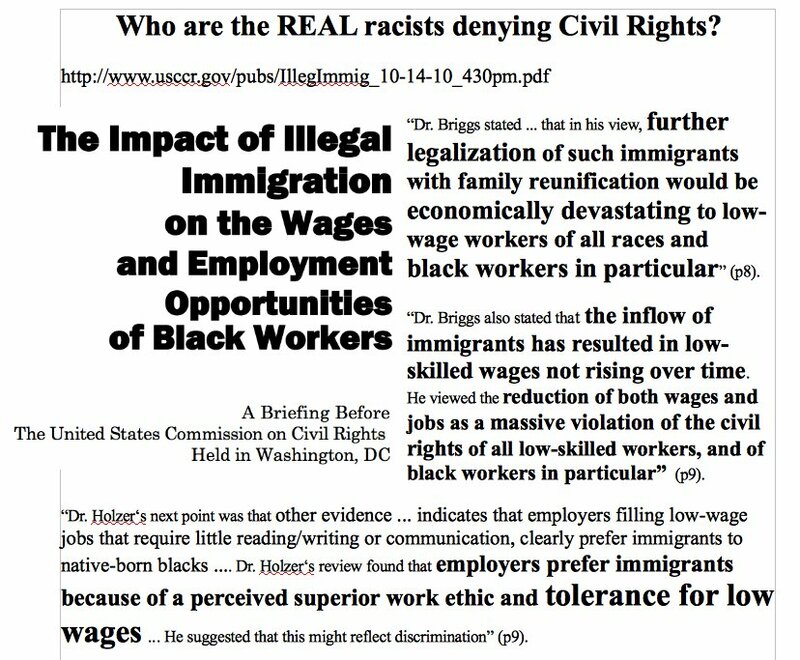 U.S. Civil Rights Commissioners warn about amnesty's impact. Until they do, writes Lauren Victoria Burke, they’ll be out of step with many of the constituents they claim to represent. Black farmworkers are being discriminated against! National Public Radio discusses the problem. Also see Jamelle Bouie's prior piece on this issue. Black leaders from across ideological spectrum write to Congressional Black Caucus. Bipartisan group of Black leaders say amnesty will harm African-American workers. NEW! Article by Spencer P. Morrison. Article by the very distinguished Jacquenlyne Johnson Jackson. African-Americans will be harmed by the President's Executive Order. The distinguished Dr. Carol Swain of Vanderbilt University debates immigration. Waldo Benavidez is an advocate for the poor. See his NY Times profile. Many Hispanics recognize the harm of illegal immigration. Also see this CNN report. A growing number of Hispanic Americans are speaking out against illegal immigration. Jesse Laguna provides a Hispanic perspective. U.S. Senator Bernie Sanders (D-VT) helped stop the last amnesty. This goes against Dr. MLK's dream. OP-ED from an African-American member of the Dustin Inman Society. An immigrant explains why Obama's immigration plan is offensive. Yeh Ling-Ling shares how reducing immigration would benefit immigrants. The Washington Post takes notice. The San Francisco Examiner takes notice. The New York Times takes notice. Cedric Welch-Muhammad is the President of Black Electorate Communications. Earl Ofari Hutchison changes his tune, after an outpouring of opposition to illegal immigration, from his readers. Issues & Views is an African-American publication. 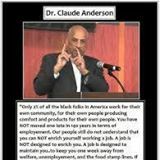 Mass immigration harms poor and Black Americans. The very-Honorable Greg Mathis provides perspective. Full article here. Hey Y'all; When is the March for Black Folks? 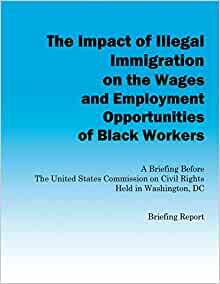 Prof. James Clingman also provides perspective, after the marches for illegal immigration. News release from the African-American organization Project 21. Quote from Cecilia Muñoz, when asked about illegal immigration's impact on Blacks. Latin Americans would benefit from amnesty at a rate 30 times greater than non-Latins! Amnesty for illegals would discriminate against immigrants. "Cast Down Your Bucket Where You Are!" Check out this pertinent paper, about immigration and Black America. "Law & Order"- Anthony Anderson's character comments on illegals' impact in South Central. Ad featuring the former director of the Congressional Black Caucus Foundation. Learn more about Jamiel Shaw, and support "Jamiel's Law"
Renowned civil rights leader Barbara Jordan on why reducing total immigration will help immigrants.